Includes two AquaBells AB2 Dumbbells, with eight water chambers, four per dumbbell. AquaBells AB2 Dumbbells weigh only 24 ounces when collapsed. 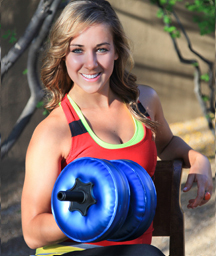 When the AquaBells are inflated they provide up to 32 pounds of weight training resistance! 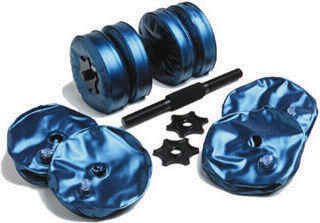 Simply fill theA quaBells AB2 Dumbbells water chambers with water to achieve the desired resistance. Then attach them to the comfortable soft cushioned grips and in minutes they’re ready to use. With all four weights filled and attached to the handgrip bar each dumbbell weighs 16 pounds. When you are ready to go just deflate your AquaBells and they are ready to travel again! AquaBells AB2 Dumbbells have many other advantages: they are quiet and will not disturb roommates, or cowork ers. In addition AquaBells are soft so there is no danger of damaging floors or furniture. AquaBells are constructed of high tech polymers, so you will enjoy years of service. When inflated with air only, AquaBells also function as a great water resistance exercise program when used in swimming pools. The set of AquaBells AB2 Dumbbells weigh less than 26 ounces and are so compact that they can fit into your briefcase. It's easy to fill with water at your destination, and these innovative weights can provide up to 16 lbs. of resistance per dumbbell. Fill the weights to your desired weight resistance and secure them on the cushioned bars. When it's time to pack AquaBells, they empty in seconds. Work out in the privacy of your hotel room, home, or office. Guaranteed not to leak. Great for physical therapy, and also can be used for water resistance programs when in swimming pools, too! The set includes two 13" long bars, with soft cushioned grip handles, with eight fillable weights. 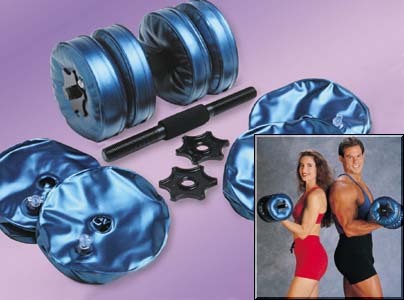 Order your AquaBells AB2 Dumbbells by Aquabell from FitnessZone.com today!